I don’t have a green thumb by any means—in fact, I’ve been known to accidentally kill hibiscus bushes so many summers in a row that I gave up on having them anymore—but I really love nature and plant life. Especially in Mexico, there are lots of plants that I’ve grown to love that I wasn’t exposed to while growing up in the Midwest. The Reserva Ecológica del Pedregal de San Ángel at UNAM is one of my most-cherished nature spots in Mexico City because of all the wildflowers, wild nopales and cactus fruits known as tunas. As you might recall, bugambilias are one of my favorite plants in Mexico (I’ve shared photos of them in Cuernavaca, Huatulco and other cities). Another of my favorites is the jacaranda tree, pictured here, which has beautiful bluish-purple hued blooms. They bloom in the spring in Mexico City, so I love going to visit during Semana Santa to see them. My suegro sent me this photo several weeks ago, taken on the UNAM campus, because he knows how much I love to see the trees full of flowers. In Los Angeles, thanks to the climate, bugambilias are abundant here, and jacarandas too. In fact, the jacarandas have been blooming for several weeks in my neighborhood. Aren’t they beautiful? What kind of plants do you love in Mexico? Hi Maura. Love that Jacaranda tree. I bought one for my Mom a couple years back. She had seen it on California’s Gold show on PBS and fell in love with it. It’s doing great. Thanks for sharing. Have a great rest of the week. Thanks for stopping by to share, Gloria! I’ve always wanted to have a jacaranda in my yard. Omygoodness, I LOVE these trees. Im here in Mexico City and we just saw their blooming season. Now its the dreaded rain-everyday-no-time-tohang-the-laundry seaon. Ugh. Thanks so much for posting, I ask everyone their name here and no one ever seems to know. Last summer I had 2 bugamvillias on the roof and they would dry out, come back, dry out , loose all leaves, come back. So so sad. Ithink their potswere way too shallow? Who knows. 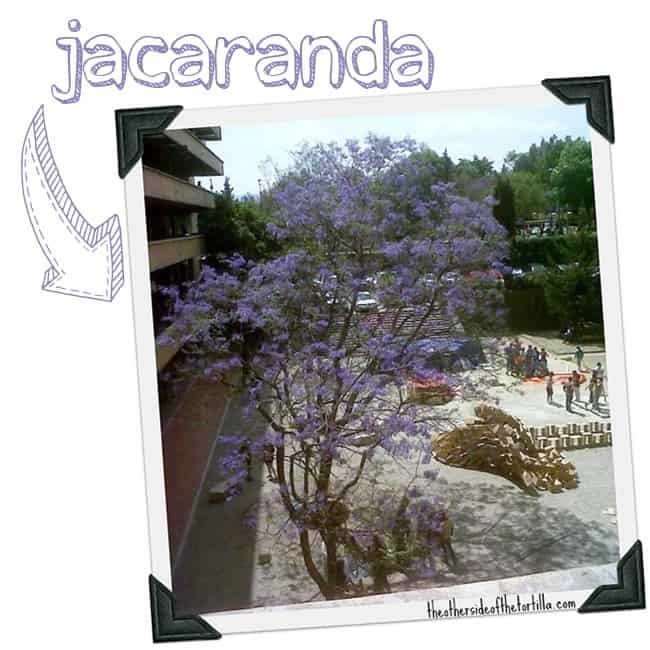 Tricia, I love to drive through Coyoacan during the spring when the jacarandas are in bloom. I seem to remember that the UNAM bookstore has a small book full of all the local flora. If I can remember the name of it or if I see it on my next visit, I’ll let you know.